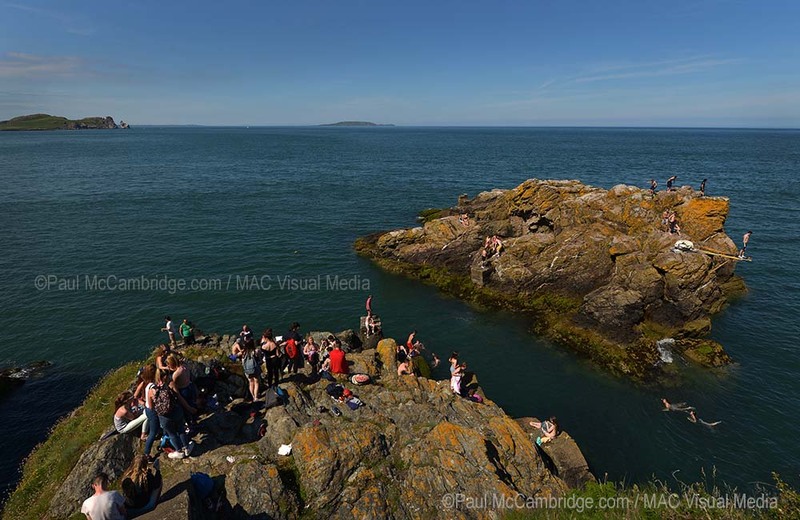 On this, the first weekend of summer, a festival vibe sweeps along the coastal path from Howth as a host of teenagers in swimsuits and shorts flock alongside tourists. Clutching their return tickets for the Dart they pass the cliff top shop, towels slung over shoulders and lost in chatter. No longer allowed to jump from the pier and now fined if they do, they instead have re-claimed an old diving haunt a little way along the craggy coastline. Leaving the tourists to watch as they drop down off the main path onto a beaten track clearly used year round by fishermen, they make their way to a vertiginous staircase. I thought of Escher and his drawings of the impossible stairs or Harry Potter with the moving staircases of Hogwarts. With no railings and seemingly suspended held only by their own weight, the steps span the cavernous drop to the rocks below and lead onto a rocky outcrop where the concrete plinths of old diving boards still remain. The water is deep and clear, I can’t see the bottom but I can see that it is very deep and there are no dangerous rocks beneath the surface, a perfect dive pit. 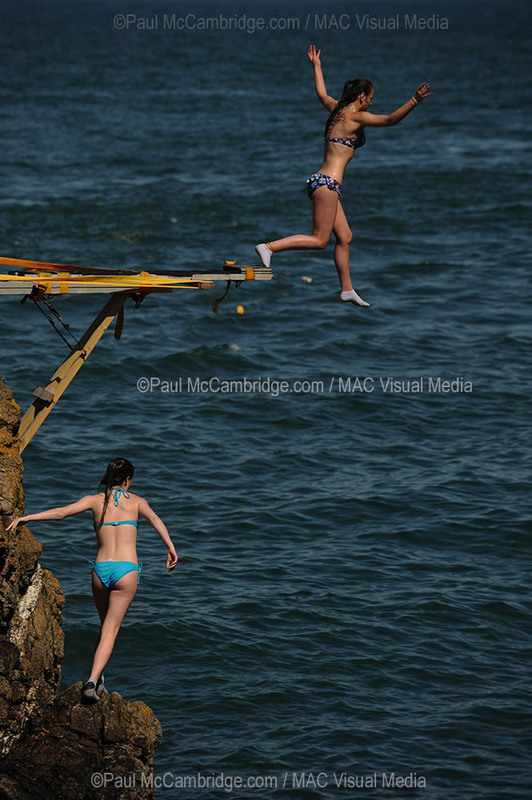 Plunging in and swimming the few metres to the diving platforms, teens scramble up the cliff in swimsuits, with socks the only protection for bare feet on the barnacle encrusted rocks. Tourists shout encouragement from their vantage point on the cliff path above as a wet-suited young man ventures to the highest plinth. He steps to the edge, clenches his fists then backs away. Gripping his long hair in frustration as he repeatedly goes through this performance. The spectators are getting restless, cries of “Go on! Do it! It’s not that high!” Cameras are poised for the action as anticipation builds. The board below him looks only about 3m from this height. It’s only when I get down the path, level with the board that I can see I was mistaken. The lower board I would estimate 5 – 6 metres above the surface that would make the higher plinth close to 10 metres. I’ve jumped from 10 in Dublin’s NAC, once, and there’s a lot of time on the way down to realise that you just might have made a mistake. Across the deep green natural diving pit, four young men line up along the facing cliff. Standing level with the high plinth, one after the other they leap. 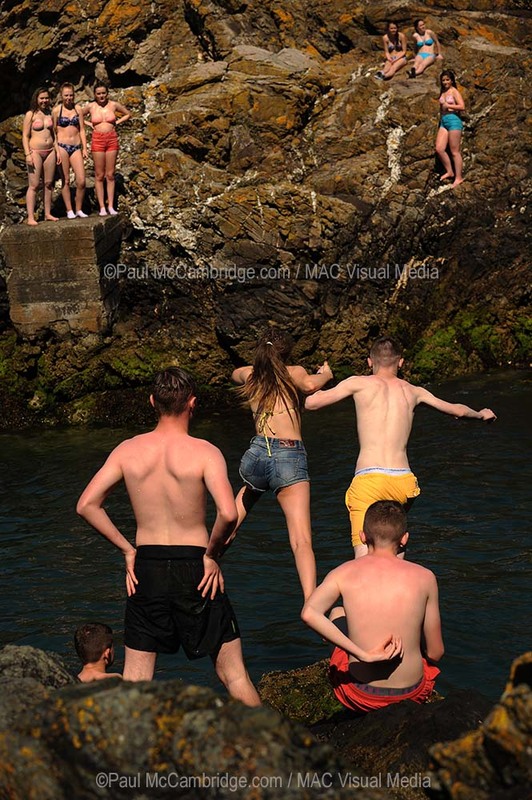 The sharp smack as their canvas shoes hit the water reverberates around the cliffs, applause from the coastal path high above as their whoops of delight carry up to the crowd. They swim across to a small rock and rest in the sun. One standing as the others sit they look from a by-gone age. I am hit with a thought of this very same scene happening in the twenties or thirties, a ‘great Gatsby-like’ vision of young men in their prime enjoying the beginning of a seemingly endless summer. 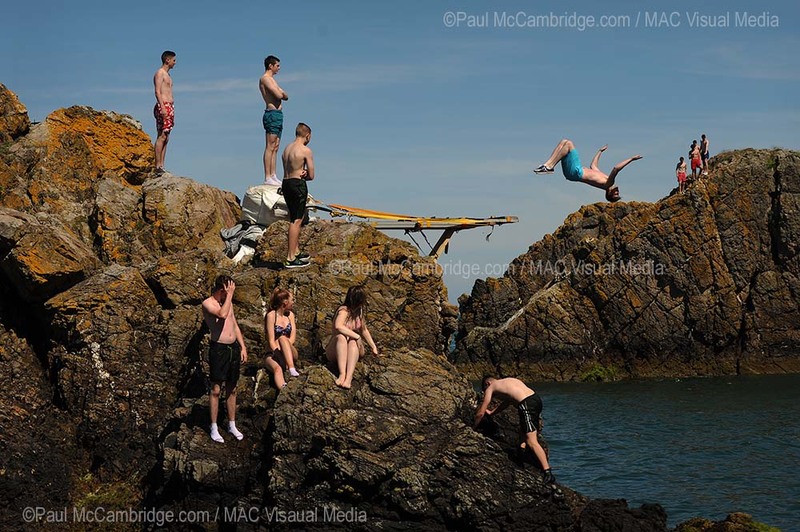 Finally they decide to join the throngs of younger divers on the main rock. We leave the rock littered with girls and boys, their happy chatter and laughter echoing as we cross that impossible staircase again.